ESTI MELLUL of Teaneck said she was honored to be invited to the annual dinner by one of Rutgers Chabad’s rabbis, Shaya Shagalow. Mellul received her bachelor’s degree in 2016 and her master’s from the university a year later. The 40th Anniversary National Founders Dinner was held in the grand ballroom at The Les Turchin Chabad House in New Brunswick on March 18. About 250 people attended. Guests of honor included Danny Danon, Israel’s ambassador to the UN; alum Dr. Ari Green; and Sephardic community leader Harry Adjmi. In his remarks, Danon joked that he is like a Chabad shaliach, or emissary, for Judaism in the UN — inviting colleagues to participate in Jewish rituals, bringing them to Israel, and revealing how much modern technology is produced in the Jewish state. “This combination of Judaism, technology, and bringing people to Israel — this is the recipe for winning at the UN,” he said. The dinner, which raised over $500,000, attracted supporters beyond students and their parents. David Young of Aberdeen, for example, has four children, none of whom attended Rutgers. Young said his attendance continued the legacy of support for Chabad left by his father, who recently died. Today, The Les Turchin Chabad House offers men’s and women’s dormitories, daily kosher meals, Shabbat programs, Ashkenazi and Sephardic minyans, social events, educational programs, and more that, by Carlebach’s estimate, reach over 7,000 students annually. 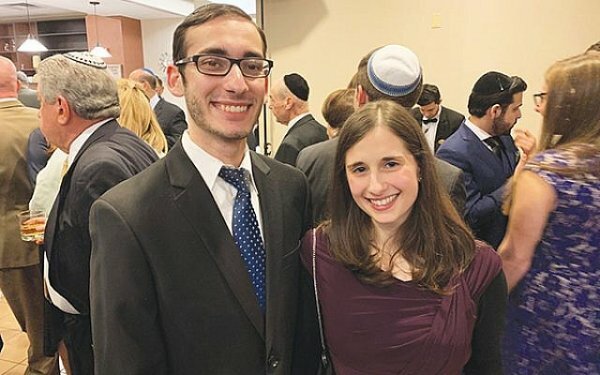 Benjamin Hutt, who served as a resident assistant at Chabad for several years until his graduation in 2016, called Chabad “a place I knew that would accept me no matter what,” a place where he was able to study Jewish texts and find a home away from home. He, too, has remained close with the rabbis; Shagalow officiated at his 2018 wedding. Roy Tanzman, chairman of the board of Rutgers Hillel, said he has been involved with Carlebach since he started Chabad on campus in 1978. “I think it’s nice to have a Chabad,” he said, as having Jewish options is good for the campus. “[Rutgers] is a great place to be Jewish,” said Tanzman. Some current students expressed their appreciation for the Rutgers Chabad community. “I feel like I have a second home here,” said Eden Lebowitz of Highland Park, a freshman who lives in the dorm. Her friend Rifke Anolik, a junior also from Highland Park, loves how “accessible” Chabad is to all students. She said she attends a variety of weekly events, from the Tuesday night café to Shabbat dinners. “Even though I’m not living on campus I’m always here — there’s always something going on.” She was helping at the event “out of appreciation for Rabbi [Baruch] Goodman and all that he does for us,” she said about Chabad’s campus activities director. Mellul praised the flourishing of Rutgers Chabad. “I think it’s amazing that they have come this far,” she said, citing the attractive building and robust programming.